I wanted to try preserving some pictures for a fun coaster and a unique way to display your vacation photos! - Resin - I used Easy Cast, but Envirotex Lite would work too! - Laser printer (you can go to a Kinkos or office supply store and they may be able to print them for you). I started with vacation pictures and printed them on a transparency film using a laser printer. Try not to touch the images, you don’t want to get finger prints on them. I cut them into circles using a circle cutter, but you could trace a circle and cut it with scissors. The circle cutter didn’t cut all the way through, I had to follow up with scissors. I cut them just smaller than the mold cavity. I prepared my resin. I used Easy Cast, but Envirotex Lite would work too. I poured it into the molds. I prepared 3 ounces of resin total. Once the resin is in the mold, I gave it a minute or two before using a lighter to pop the bubbles. Then, I carefully slid the pictures into the resin. Using my stir stick, I pressed them down, making sure I press all the bubbles out from under the pictures. Then, it’s time to let them cure, a minimum of 12 hours before unmolding. That’s it! Thanks for stopping by! Happy Crafting and stay safe! 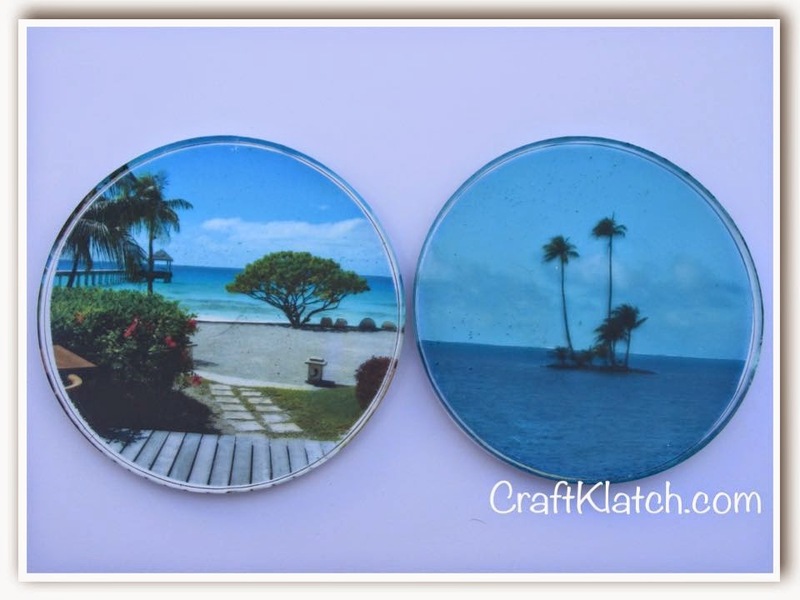 Your picture coasters is a really neat idea.......and great conversation piece also. Thank you for sharing with the Clever Chicks Blog Hop! I hope you’ll join us again next week! I love all the coaster ideas! I am wondering if there would be a way to insert a loop of some sort during the curing process to make an ornament out of it? ?